Kennel Waytogo is located in north of Sweden and was founded by Anna-Britta Antonsson in 2009. In 2013 Tori Malm became co-owner of the kennel and in 2017 Anna-Britta exit the kennel. 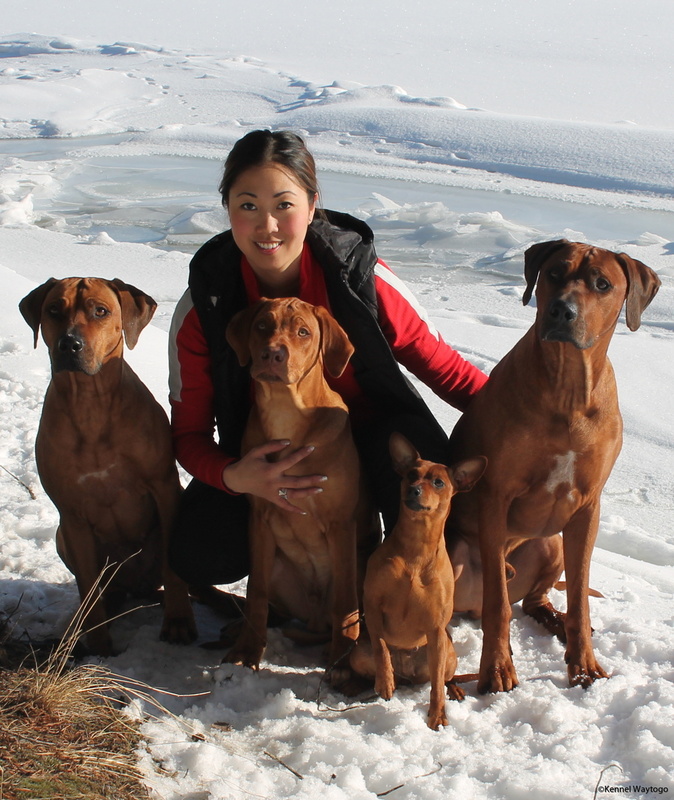 I live in Sollefteå and I'm breeding both miniature pinscher and rhodesian ridgeback. I'm also a handler, dog trainer and groomer of many differant breeds but my specialty breed in grooming is miniature schnauzer. I got to know mini pins in 2005 and the next year I got my first own dog, in 2009 my first litter was born. When I met Anna-Britta in 2008 I soon realized that ridgeback was my "new" breed and when it was time for Leya to have her first litter I knew I wanted a puppy from her. In 2010 the apple of my eye was born; Waytogo Halo 'Telma'. In 2014 my second ridgeback came to me from Slovakia; Excellent Nikki of Perla Afriky. Nikki entered into our lives like a breath of fresh air! In our home we also have company of Zoey the chihuahua and our cat Lillebror. Over the years I have been fortunated to meet many different mini pins and ridgebacks but also dogs of other breeds, this has given me a very clear idea of what I seek for and what I will achieve with my breeding. For me, the primary is that a dog will fit into everyday life; around adults, children, other dogs and any other animals. To make this possible, a good mental health is a must! Of course I also strive for a good physical helath, to breed on known defects or ilnesses is not an option even if the dog is a nice individual. If the dogs I breed turns out to have well balanced bodies suitable for shows, I see it as a bonus. I wish to give my puppies and their owners a good start of their new lives together, to be there to support them through all the different situations that may arise with a big or small dog. I've always had a close relationship to my breeders and for me it's important to give the same support to my puppy buyers.